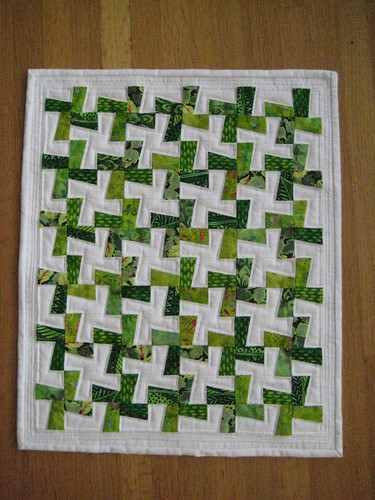 The challenge project for March has been announced, we'll be doing a Monochromatic Quilt Challenge! *Choose one color (since we all wanted to use up our stash in 2011 it's your choice) and use the various ranges of that color to make your project. For example - if you choose purple you can use lilac, lavender, egglant, etc. These can be prints, solids or both. *The use of one neutral in addition to your color is optional. *Bring to the meeting on March 15th to show off! Also check out this quilt at Crazy Mom Quilts and search Monochromatic Quilt on Flickr for tons of beautiful inspiration! The Modern Quilt Guild is hosting a similar challenge. If you are interested in making your quilt fit both challenges you need to go here to find out their rules and size requirements. Most of all - have fun! Let us know via the Google group page if you will be participating.